Whisky, Sterling & Brexit: What will a weak Pound mean for Scotch's major markets? AT FACE VALUE, exports of Scotch whisky have slipped over recent years, writes Leon Kuebler at WhiskyInvestDirect. But in reality, strength in the Pound was hiding Scotch's solid popularity worldwide – strength which has now vanished since the Brexit referendum result. As noted previously in WhiskyInvestDirect's news and analysis, the GBP value of Scotch whisky exports was 10% lower in 2015 than at its peak in 2012. Yet once you factor in the strength of the Pound relative to other currencies, global spending on Scotch has remained broadly constant. In fact, worldwide spending on Scotch in 2015 increased 2.5% year-on-year, reaching a level only 1% below 2012’s all-time peak. So with the Pound now at historic lows following the June 23 vote to leave the European Union, the export value of Scotch should, in theory, receive a boost. In practice, however, Sterling’s current weakness will not have the same impact on Scotch exports across the globe. To see where a weak Pound is most likely to boost imports of Scotch, we need to look at the national picture. The chart above shows the amount spent on imports of Scotch whisky in the 10 most valuable markets for Scotch. To give the long-term trend in consumption patterns without distortions from the exchange rate, the data has been converted to local currency, and indexed to the amount spent in 2010. As we can see, the amount of money spent on Scotch whisky has risen in seven out of its ten largest markets since the beginning of the decade. 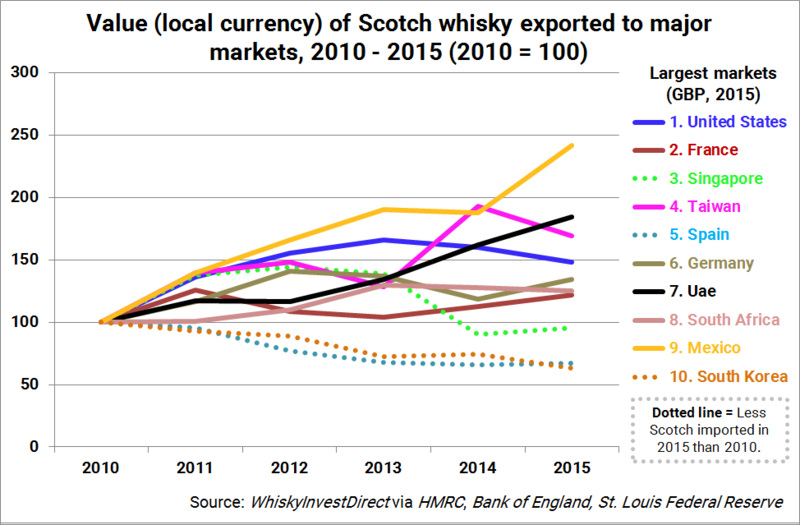 In each of these seven markets, the amount of local currency spent on Scotch imports in 2015 was 20% higher than in 2010. One country – Mexico – has even seen local spending on Scotch rise 140% in 5 years. Not every major destination for Scotch has seen a growth in imports over this period. Both the amount spent on Scotch, and the actual volume of whisky imported, has decreased in three countries – Singapore, Spain and South Korea. In Spain and South Korea, the amount of Scotch exported to each country last year was around half that sent in 2008. In both of these countries, it is clear that demand for Scotch is declining long-term. The case of Singapore is a little different. Singapore acts largely as an entry point for Scotch en route to mainland China, and the decline in whisky imports post-2013 is directly linked to Xi Jinping’s crackdown on corruption, which began in earnest in the same year. As this drop in Scotch imports is an outgrowth of the current political climate in China, it does not suggest a fundamental drop in demand – although, given that the China Policy Institute argues that Xi’s anti-corruption drive may have become the “new normal”, there is no guarantee that exports to Singapore will regain the heights of 2013 any time soon. Sterling’s newfound weakness is therefore unlikely to have a big impact on Scotch exports to Spain and South Korea. But in all other major markets, where local spending on whisky has risen over this decade, the weak Pound should prove a boon to imports of Scotch. And since these eight countries accounted for over half of the GBP value of Scotch exports in 2015, the impact could be dramatic.